If you are like most HubSpot users when you hear the words "HubSpot Form" a few of things come to mind. Most of the time it's a HubSpot Form on a HubSpot Landing Page that does something "typical" like collecting information for a downloadable piece of content or getting contact information for a consultation or demo request. Sometimes you need something a little bit more sophisticated to create engagment. Are there limits to HubSpot forms? Have you dreamt of making really useful tools on your site with forms? Like maybe a calculator or a survey? Have you ever tried to make a muti-page form in HubSpot? Kristen on our team wanted to do more with forms a few months ago. We have a pricing page. Pricing pages are ok but you can't really plan with something that says "Starting at". Kristen wanted to do more to help everyone by making a "Website Estimator". When we were searching for an answer we found out a lot of people were in the same situation. If you tried too, you may have ran into a challenge. HubSpot's Form tool limits you to creating a single form on a single page. Or so we thought. We needed something fast. Figuring it out on HubSpot seemed impossible and wasn't easy like using a template or a plugin. We did this the first time without HubSpot. Kristen figured out how to make a pretty cool estimator with a Google Form. Aside from "looks", the biggest problem with this is that we lost HubSpot Timeline Insights. When people filled out the Google Form we had no record in their timeline of what they did before they filled it out. We rely on knowing what happened for a visitor before they got to the tool. We were flying blind with an empty timeline. 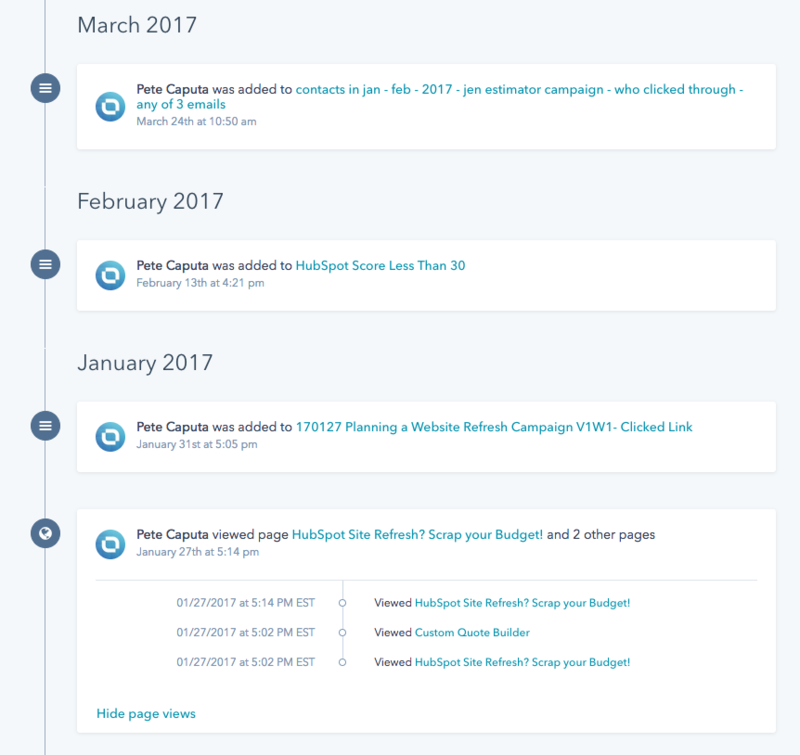 This is an example of the HubSpot timeline. We needed the information you see above. After a hundred people used the estimator, it was long overdue to get this right. It was time to revisit making the estimator using a multi-page HubSpot form. There were a a few key things this HubSpot Advanced Form needed to do. 1. It needed to show progression. HubSpot calls this a multipage form. We have links below with instructions on how to make this. 2. It needed to have what is called "progressive profiling". Simply put, presenting a subset of choices based on preceding a selected choice. We made it with HubSpot. We found a way to make it work in HubSpot. Kristen was now able to do what she wanted with HubSpot forms. The mega form (which uses multiple forms) becomes multi-page instead of single page to accomplish the important part of the job. Can anyone make an Advanced HubSpot Form? After we made this tool we thought you'd find it helpful if we showed you how to do it. There's no "clear" documenation on this, and a lot of people think it can't be done. Doing this is a tedious process and takes quite a bit of time to set up on your own the first time around. If you don't have the time and want someone to help, tell us what you're thinking. If you like to dive in and learn on your own, we made a free course. Kristen walks you through what she did and gives instructions. See how Kristen did this watch the video and get the 'secret' instructions. 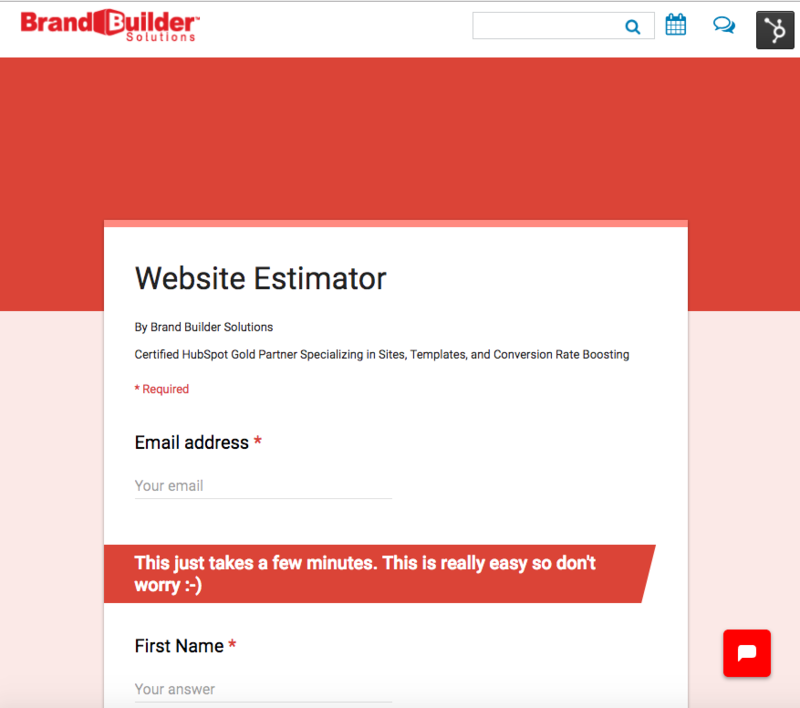 Try out our Website Estimator Tool! help you establish your budget.